Port Melbourne might not have the most diverse restaurant scene, but it seems that when it comes to pub parmigiana, it is a bit of a Mecca. The authoritative ranking at parma.com.au currently has both The Local and The Exchange in the top twenty nationwide (at #11 and #19 respectively). However many of the top venues are in regional Victoria - once you limit the search to venues currently trading within 25km of the CBD, they leap to second and fifth place (shame this wasn't a criteria for suburb livability)! With scant regard for my own health, I set about comparing and contrasting these pub's offerings to see if their accolades were justified. The pictures above show the dishes offered by The Local (on top) and The Exchange (below). Both offered a similar quantity of reasonably fat chips, however apparently placing them under the bird is a faux pas amongst parma nerds, so the Exchange started off well. 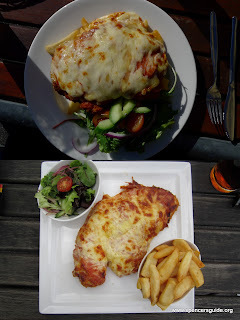 Also the pictures are not at the same scale; the Exchange's plate (and hence schnitzel) was sizably bigger. However it's not all about quantity (as the Hotel Albion's ranking atests, despite offering a triple parma). For starters the Local's offering is 20% cheaper, bringing it under the magic $20 barrier. They also offer a bigger and better salad. But when it comes down to the critical chicken, ham, napoli and cheese topping, they are both ... very tasty. In the end, for me, the Exchange's was slightly more moist and definitely more gut stretching, however whether it's worth the extra note is debatable.